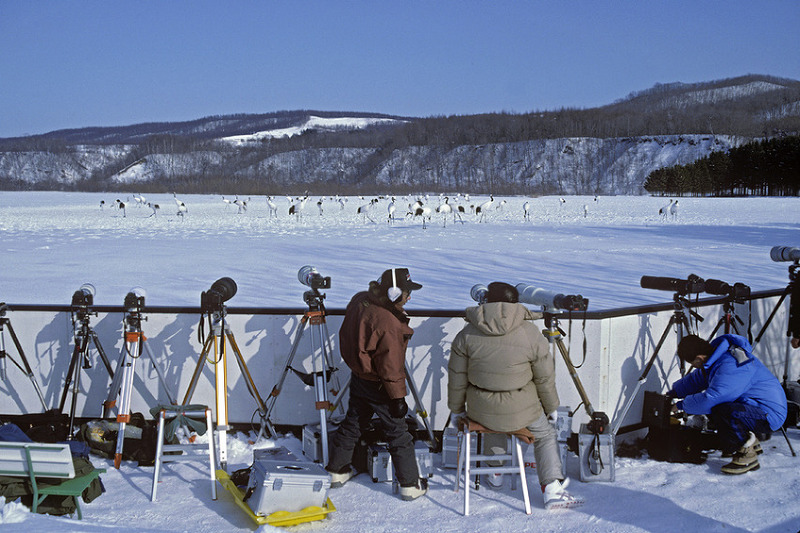 Japanese photographers’ gear set up to take Japanese cranes in winter on Hokkaido, Japan. Note sledge to carry gear across snow. Below this copy are archived posts that specifically relate to photographic gear. My philosophy is that every bit of gear must earn its keep, so I never rush to upgrade whenever a new model is released. Instead, I wait for the reviews to appear and even then opt not to replace until I need a specific function or my main workhorse suffers a major mishap. Gitzo carbon fibre GT3540 6X with Really Right Stuff BH-35 ballhead. Benbo Mark 1 – for working in water, since the lower leg segments slide over the upper ones, they can be immersed in water up to just below the locking knob. Short for Plamp clamp, made by Wimberley. Used to steady a plant stem in a persistent breeze, for precisely holding a small reflector, a diffuser or an anti flare flag and for holding a branch out of shot. My name is Svana or Svanhildur. I have a MSc in Biological Photography and Imaging from University of Nottingham, graduated last December. Unfortunately I was not able to meet you at Slimbridge during the course, when you met the rest of the group. I saw on Twitter that you are planning a trip to Iceland, if you do have time I would like to meet you and maybe get some advice about my first steps as a photographer. I live in Iceland and have done so for the last 50 years (except one year in UK), maybe I can assist you about Iceland. Good to hear from you. Sorry to hear we missed out meeting at Slimbridge and also to disappoint you in that I have no immediate plans to visit Iceland. My blog ending was hypothetically looking into the future. However, I love your country and I am sure I shall return, in which case I shall get in touch. At the moment I am busy working on another book for Kew Gardens about pollination of flowers – all over the world. I noticed that you used to shoot underwater, so this may amuse you. I still use Nikonos (mainly because the cost of upgrading to digital at the same level is quite high and I’m getting on a bit in age). For the past few years, if I come back from a dive with film left in the camera, I burn off the last few shots on flowers in the garden. The Nikonos is brilliant for this, with twin strobes, using either the close-up kit or extension tubes and overwater framers. As you can imagine, with everything on the tray, it’s very easy to position the camera and take the shot. And of course, the light fall off from very close strobes allows a vibrancy in the subject and a separation from the background. I’m really enjoying your Pollinator book. That’s most interesting – never heard of anyone else usng their Nikonos for flowers, but I can see it would work. Glad to hear you are enjoying my pollination book. Now working on a more ambitious one looking at 100 species with interesting pollination stories and relating research done on them. I am a 14 year old student in the UK. I have just begun my GCSE Photography course and our first project is ‘Natural Forms’. I have a Canon D2000 digital SLR camera and I am saving up for a macro lens. I love your work and wondered if I could ask you a couple of questions to help with my research please? 1. Do you any tips for shooting macro images of plants? 2. What lens would be a good starter lens? I appreciate your reply very much as I know you are incredibly busy. •	Decide best format. If taking an erect spike then vertical will be better than a horizontal/landscape format. •	Aim to get the sensor plane (i.e. back of camera too) parallel with the part of the plant you want to appear in focus. •	If wind blowing, need to use a fast shutter speed to freeze movement. At least 1/250 second but may need more. 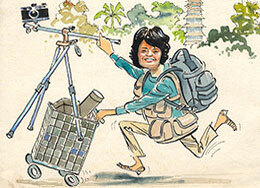 •	If no wind use a tripod to aid precise focusing, it also allows for a slow shutter speed in poor light. •	Check background and make sure it is not distracting. If you look at my shots will see I try to get simplest background possible so does not compete for the subject. •	Decide which part of the plant to focus on (I prefer manual focus to AF for small flowers). As I have used Nikon all my life, I regret I know nothing about other macro lenses. Suggest you do a Google search for Canon macro lens and Tamron are usually cheaper than Canon or Nikon, but you will need to check compatibility with your Canon camera with any macro lens. So far as focal length goes, a 100mm lens will be preferable to a a60mm lens because there will be a greater working distance between the front of the lens and the subject – useful for angling in a reflector if needed. The cheapest way to get in close is to add a close-up lens (now called close-up filter), which simply screws on to the front of the lens and functions in the same way as reading glasses for focusing short distances. This will not get you such great magnifications as using a macro lens however. I hope this helps and good luck with your GSCE.